Growing up in San Francisco, O.J. Simpson ran with a street gang called the Persian Warriors or Persian Kings. He was briefly incarcerated at the city's juvenile detention center. Simpson was a fine football player, winning the Heisman Trophy as the game's best college player while attending the University of Southern California in 1968. In the pros, he played for the Buffalo Bills from 1969-77 and San Francisco 49ers from 1978-79, winning All-Pro honors five times and the Most Valuable Player Award in 1973. He was the first player to run for 2,000 yards in a season. It has been done since, in the NFL's current 16-game season, but Simpson remains the only man to accomplish it in 14 games. He always wanted to be an actor, and his football celebrity got him some slight roles in late-'60s TV shows like Dragnet and Medical Center. After football, Simpson worked regularly in movies and on TV, including Roots, The Towering Inferno, Capricorn One, and the cable series 1st & Ten. He also had a recurring slapstick role in the Naked Gun movies. His most famous role, though, was as pitchman for Hertz, perpetually running through airports. 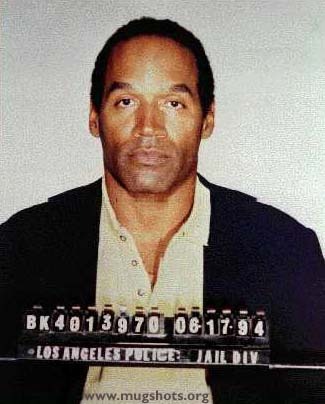 He met his second wife, Nicole Brown, when she was 17. They began an affair before he had divorced his first wife, and married in 1985. In 1989, Simpson was convicted of spousal abuse for beating her. He got probation, community service, and fines totaling less than $1,000. In 1992 she divorced him, and in 1994 she was knifed to death along with her friend, Ron Goldman. Simpson was considered a suspect, and promised to turn himself in to police, but he didn't show up at the agreed-upon time. Several hours later his white Ford Bronco was spotted, trailed by friend Al Cowlings. Up to 100,000,000 people watched as a "low-speed chase" down Interstate 5 was telecast live across America. When Cowlings parked at Simpson's house, cops waited 45 minutes for Simpson to step out of the car. He had $8,000 in cash, a fake goatee and mustache, his passport, and a loaded pistol. Simpson's trial was a huge media event, lasting eight months and covered at length daily. Americans were introduced to a parade of colorful characters, including Lance Ito, the judge of questionable competence; Kato Kaelin, Simpson's lazy houseguest; and Johnnie Cochran, his slick defense lawyer. When prosecutors asked Simpson to try on the killer's gloves, he couldn't squeeze his hand inside, and it was Cochran who famously quipped, "If the glove doesn't fit, you must acquit". Curiously, in the course of their "investigation", detectives had obtained samples of Simpson's and the victims' blood. This is, to say the least, not proper police procedure. When asked on the witness stand whether he had planted any evidence to frame Simpson, LAPD Detective Mark Fuhrman invoked his Fifth Amendment right not to incriminate himself. Simpson was acquitted, and vowed to devote his life to finding the real killers. Instead, he played a lot of golf, and was later imprisoned for armed robbery. In a civil trial, where standards of proof are lower, Simpson was found liable for the deaths of Nicole Simpson and Ron Goldman. He was ordered to pay damages totaling more than $33,000,000. In 2004, he was ordered to surrender his income from autographs. So, did O.J. Simpson get away with murder? In 2000, a BBC investigation suggested that in their rush to prove Simpson's guilt, police had neglected a more likely suspect -- Simpson's son by his first marriage, Jason. Jason Simpson was 24 at the time of the killings, and like his father had a history of violence. The younger Simpson was a professional chef who had previously brandished knives when enraged. He was on anger-suppression meds at the time, and his alibi for the night in question -- that he was working -- was challenged by co-workers. Also, according to BBC's reporters, Nicole had said she thought Jason Simpson was stalking her.